Finalists from Maxim Magazine’s “Hometown Hotties 2010” competition pose for a victory shot after a game of touch football with Marines from the 3rd Assault Amphibian Battalion. Five of the ten finalists paired up with the 3rd AAV to defeat 1st Marine Division’s Headquarters Company during a recent stop at Camp Pedleton, Calif. Marine Corps photo. Marines are known for looking sharp, but they don’t hold a candle to Maxim Magazine’s 10 finalists in the Hometown Hotties 2010 competition. The top 10 recently made a stop Aug. 27 at Marine Corps Base Camp Pendleton, Calif., for a pickup game of touch football with a few Marines. 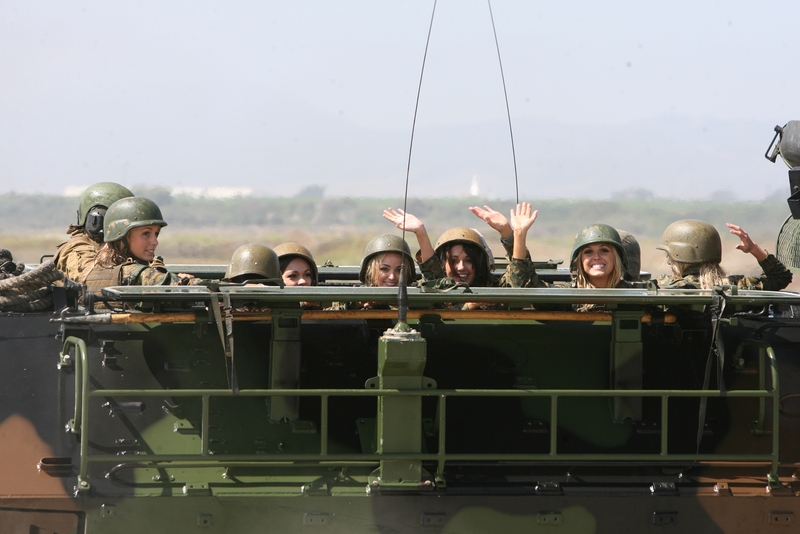 They also signed posters, posed for photos, and took a ride in an Amphibious Assault Vehicle. For full coverage and photos of the event visit Maxim’s website. The Hometown Hotties pose with 1st Marine Division's Headquarters Company after being defeated in a game of touch football against the 3rd Assault Amphibian Battalion. Marine Corps photo.